Many passenger wagons make it difficult for drivers to keep an eye on what is going on around them. 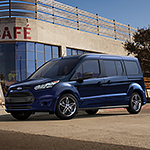 The stylish and popular vehicle known as the 2019 Ford Transit Connect Wagon brings several technologies to bear that are designed to extend driver visual awareness. One such tool is the proprietary rear camera system. The 2019 Ford Transit Connect equips drivers with a centrally located viewscreen that projects camera footage from around the vehicle. This system works on a hands-free basis and kicks into action whenever drivers put their transmissions into the reverse gear set. It also includes special visual guides to help drivers to align their vehicles when parking. In addition to the advanced camera systems, the 2019 Ford Transit Connect Wagon deploys a wide variety of passenger protective airbags. The Transit Connect Safety Canopy System consists of airbags mounted in roof rails that can inflate downward during accidents. This system can give the heads of passengers extra protection along with the regularly mounted airbags.